Our apartment is from 1919 and contains two bedrooms, one living room, two bathrooms and kitchen. 1 Kids room with 2 single beds (adult size). It is located in a typically friendly classic Stockholm neighborhood and in a charming old house with a small courtyard. The hallway is recently renovated and you'll have access to a top modern laundry Which is free of charge. 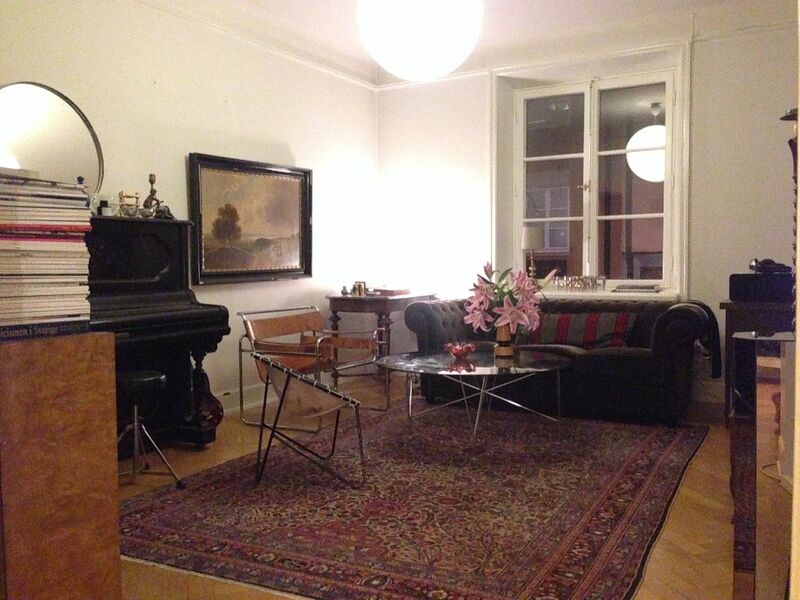 Our apartment is located on the beautiful island of Kungsholmen (King's Island) In the heart of Stockholm. We live on a quiet street close to Stockholm's Largest park Rålambshovsparken and one of the most famous promenades in town, Norrmälarstrand, Which Numerous restarurants and cafés alongside the waterline. Stop for a drink or meal while walking to the famous City Hall Which is a 15 minutes walk from our apartment. If you like to experience The Alternative Stockholm, take the 5 minute bus ride (or walk) over the scenic West Bridge ('Western Bridge') with the best view there is, thats connects to Södermalm. The Subway That takes you pretty much all around the city is 1 minute away by foot. The Waterways of Stockholm are not only beautiful to look at, they are so clean and clear you can take a dip right in the middle of town, just about 10 minutes walking from our appartment. Please let us know If You Want Any Further hints Regarding Please let us know If You Want Any Further hints Regarding sightseeing, exhibitions, museums, children activities, restaurants, cafés and shopping etc. We'll have a piano in the living room That you May use. Très beau séjour à stokholm, appartement très agréable et bien situé dans la ville ... Accueil très prévenant des proprietaires, appartement avec tout le nécessaire et très confortable et facile d'accès pour tous les transports. Two separate toilets, but unfortunately the bath room is missing proper ventilation. Shared free of charge laundry room inside the house with professional machines for washing and drying are highly helpful. The furnitures are all comfy and a mixture of interesting different styles. Hugh wide screen TV with HDMI connectivity allows watching internet movies through a mobile device. WLAN works very well in the living room. Underground into city is virtually around the corner. But you can also walk easily to interesting places nearby including supermarkets. The owners are very helpful and easy to liaise with. We liked our 2.5 weeks stay very much! Big thank you. Please let us know if you want any Further hints Regarding sightseeing, restaurants, cafés and shopping. We've been residents in Stockholm for almost four decades.